Dermal fillers are also known as “soft tissue fillers”. They are a substance which is injected below the surface of the skin. The purpose of dermal fillers is for the patient to look more young or more beautiful after treatment. Dermal fillers are used to enhance appearance or to treat ageing. They can be injected under most of the skin of the body, from the scalp to the toes. They can be used to for volumising or to treat folds or wrinkles, or to reshape the face. Popular areas for the use of dermal fillers include lips, cheeks, chin, nose, forehead, jawline, temples and hands. As there are needles going into the skin, the procedure is not without pain, but most patients will tolerate this because they love the results. How to reduce the pain with dermal fillers? How to reduce the swelling and bruising with dermal fillers? There is some evidence that Arnica and Bromelain may reduce the swelling and bruising. With their doctor’s approval, patients can stop their fish oil and other drugs associated with bruising prior to treatment. There are the common risks, which are swelling and bruising, which occur with a high proportion of treatments. Whenever the skin is penetrated by a needle there is a risk of infection. The rare but important risks include vascular occlusion, nodules and blindness. Cost of fillers depends on type. Prices at a reputable clinic with experienced doctors typically start at $750 per syringe. Biostimulators range from $900-$1200 per syringe. What is the satisfaction rate of dermal fillers? The satisfaction rate is high. The retention rate reveals how much patients love filler ie once they have it, they want to have it again. How to choose a good injector of dermal fillers? You should choose a reputable clinic. First look at the website. It should have the names of the doctor/s responsible for the treatment. It should list their training and their professional associations. It should show the names of those who are injecting at the clinic. If in Australia please choose the name on the website and check that they are on the AHPRA register. If they are not on the AHPRA register, or are suspended, DO NOT GO THERE. If it is a mobile number, do not go there. In Australia, there are only 3 Colleges which focus on non-surgical cosmetic medicine , CPCA (Cosmetic Physicians College of Australasia), ACAM (Australasian College of Aesthetic Medicine) and Australian College of Cosmetic Surgery, Faculty of Medicine. These Colleges list their Fellows online. Look at the before and afters and the social media. Is it the style that you like? Read the website. Do they have multiple doctors available? Is there a doctor onsite at all times. For further information on this topic, please review the following post: “How to choose a good injector”. How often should I get dermal fillers? 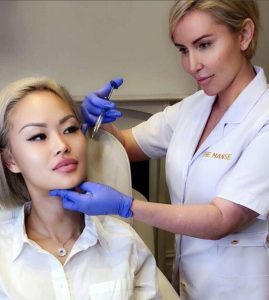 How does the doctor know where to inject the dermal fillers? This is art and science, and your result is determined by where the doctor chooses to place the product, so the doctor’s skill in face design is paramount to aesthetic success. What other procedures can I have with dermal fillers? Can I get dermal fillers while I’m pregnant or breastfeeding? Immediately after treatment with a dermal filler, there may be a slight redness, swelling, tenderness or an itching sensation in the treated area. This is a normal result of the injection and generally disappears in a few days. The initial swelling after a lip, nose or tear trough treatment may last longer. If symptoms persist or other reactions occur, please contact your doctor at The Manse. Where possible, please use the 3 Cs of post-treatment outlined below, as well as any other instructions given by your doctor. Consider a topical treatment such as Restylane Recover cream to help calm and sooth your skin. Avoid facials, facial waxing, Glycolic or AHA peels, IPL or energy based treatments and microdermabrasion for 2 weeks after treatment (unless advised by your injectable doctor). Please check with your physician before undergoing other facials within this time. Do no massage the treated area unless instructed by your physician. There is a small chance that a treatment may induce an outbreak of facial cold sores in patients with a previous history. Do not smoke for at least 24 hours after having lip injections. Even better, take this opportunity to give up smoking altogether. There are some areas, especially including tear troughs, nose and lips, where for safety and aesthetic reasons, the treatment will be optimal if it occurs over multiple treatment sessions. For many patients with tear trough filler, at least 3 sessions will be required. In general at The Manse, our recommendation is that patients have a treatment Today, then review at 1 month and further treatment on that day if improvement still wanted, then review monthly until goal is achieved and then retreat in 6 months then 6 months then yearly.